The students will be organizing and participating in a "Walk in Their Shoes" to support Doctors Without Borders. The date on this is still forthcoming but hopefully this will happen in just a few weeks and when organized I will be circulating a pledge form at our Rotary Club. The big fund raiser-the 24 hour Awake-will be happening on November 25th. As you recall, the club helps to organize over 100 students to get pledges and to stay overnight and awake at the school all night long. Last year, we had Rotarians volunteer to chaperone and everyone had a hoot playing ping pong! Again, there will be a pledge of $1000 made to our Rotary Club to help support an ongoing project, with the students deciding how to direct that money. The remainder of the money goes to the school in Africa that the students are committed to and a few other international charities as well. Jaden is going to forward me some pictures of the school-last year the money sent paid for a full science lab! We have selected 4 dates throughout the year that we will have Rotarians from our Club come and speak to Interact and we will provide pizza as well-this format for our speaker series is quite well received lol. I will be working with our Youth committee to help choose who those speakers will be. 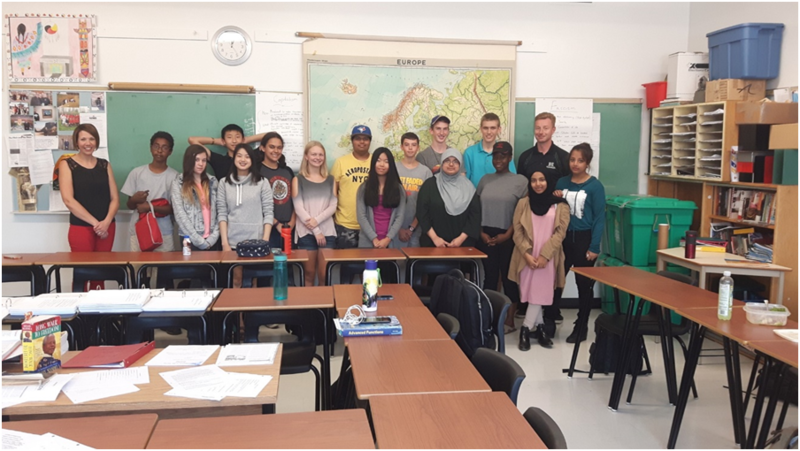 There is an idea of starting a "Conversation Club" where Interact students meet with students within the school that are just recently moved or staying in Canada-to help break down some of the social barriers.